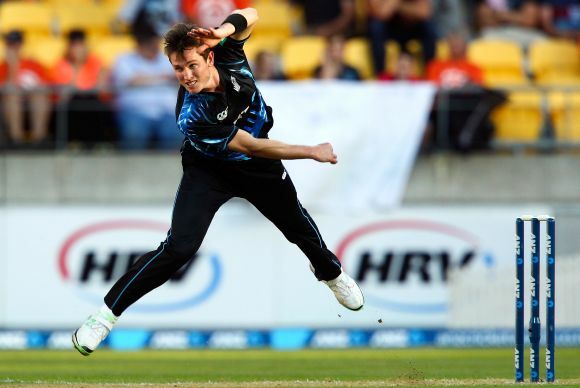 Rediff.com » Cricket » Can Team India thwart New Zealand's pace challenge in Napier? Can Team India thwart New Zealand's pace challenge in Napier? India will look to add some valuable experience and confidence when they clash with New Zealand in a five-match ODI series, beginning in Napier on Sunday. The reigning World Champions will also be looking to defend their No 1 ranking against the eighth-ranked hosts. The Indian team needs to up the ante in ODIs as the run-up to their fifty-over World Cup title defence officially begins. India will travel to Australia in the latter part of the 2014-15 season, which will be a final dress-rehearsal, and as such this series against the Black Caps is an important marker in their preparation for the World Cup. There are a host of problems bogging the Indian team down and the first of them is related to the opening combination. With both Shikhar Dhawan and Rohit Sharma not doing much in South Africa, ODIs and Tests combined there is a huge question mark hanging over the potency of this opening combo. Sharma perhaps has more time, given that he bats in the middle order in the longer format and particularly because on away tours, the role of openers to give a solid start becomes more important. Murali Vijay performed that bit to perfection in the Tests in South Africa, further highlighting Dhawan’s plight, who scored only 88 runs in six innings (avg. 14.66) in Africa. The problems in the middle order are no lesser, given that a misfiring Yuvraj Singh is no longer part of this ODI squad. The number four spot is proving to be a pain ever since this season started against Australia at home. Suresh Raina moved back to this spot in that series but the southpaw himself is struggling for consistency. Either he needs to draw experience of finishing the innings in these conditions, batting at number five or six, or he needs to learn how to drive the batting from number four, in preparation of the World Cup next year. Doing both is not an option for him or the team management. At the same time, Raina will also do well to consider Yuvraj's axing as a stern reminder of his own form. Although he continues to be a great resource for the ODI side with his sharp fielding and bowling skills thrown in, his first job is to score runs and they have only come at a trickle since last October (207 runs in 9 innings, avg. 23). He will need to watch out for Ambati Rayudu and Stuart Binny who will come into contention at some point in this series. Especially the latter, if Raina continues to bat at number five or six, since Binny too is a lower-order batsman. Binny is also useful with the cricket ball. He bowls military medium, which could be an additional usage in these windy and bouncy conditions. Yuvraj was the team management’s first-option for this role, as seen from his straight comeback from injury in the third ODI versus South Africa at Centurion, at the expense of Ajinkya Rahane who batted at four in the second ODI at Durban. Perhaps there is a hint in this to assume that the Mumbai batsman, who was in superb touch in Tests there, is a shoe-in to bat at number four on Sunday. The pace department looks settled for India as Ishant Sharma and Mohammad Shami will look to carry on from where they left off in South Africa, with Bhuvneshwar Kumar getting another look-in. Otherwise there is always Ishwar Pandey and Varun Aaron to contend with. It looks like India will play five bowlers, though spin is where the real competition is. R Ashwin needs to win back his Test spot from Ravindra Jadeja and while both are expected to feature in the Indian ODI eleven, this could shape up to be a personal duel between them. For New Zealand too, this series is a good launch-pad to firm up their plans for the future. They have a good base going already, with new players -- a healthy mix of ballistic batsmen and good all-rounders -- coming through in the preceding West Indies series. The key for them will be to put India under pressure early on in the series, putting the shorter grounds and windy conditions to good use. New Zealand: Brendon McCullum (capt), Corey Anderson, Martin Guptill, Mitchell McClenaghan, Nathan McCullum, Kyle Mills, Adam Milne, James Neesham, Luke Ronchi (wk), Jesse Ryder, Tim Southee, Ross Taylor and Kane Williamson. India: MS Dhoni (captain & wk), Shikhar Dhawan, Rohit Sharma, Virat Kohli, Ajinkya Rahane, Suresh Raina, Ambati Rayudu, Stuart Binny, Ravindra Jadeja, R Ashwin, Ishant Sharma, Mohammad Shami, Bhuvneshwar Kumar, Ishwar Pandey, Varun Aaron, Amit Mishra. Match starts: 6.30 am IST.